The experienced personal injury attorneys at Steinberg Law Firm have honed their skills through several years’ combined litigation casework. Whether the matter is a car accident, slip and fall, or another mishap caused by another’s negligence, personal injury costs can be very high. As a law firm that has provided effective personal injury representation since 1927, Steinberg Law Firm is among the most experienced at helping accident victims in Charleston and other South Carolina communities to recoup as much or all of their financial losses as possible. 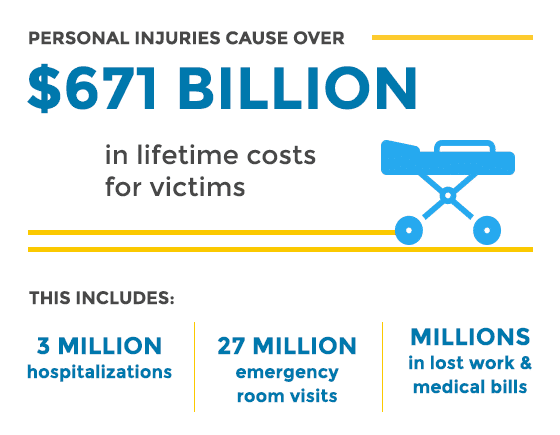 Personal injuries account for more than $671 billion in lifetime costs for victims of accidents and other mishaps that lead to serious injuries and sometimes death. 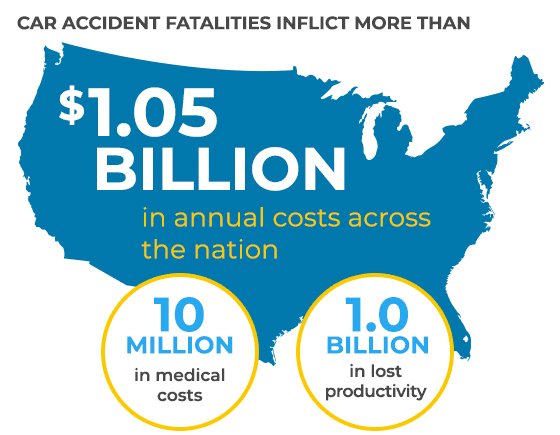 Fatal injuries cost victims across the United States a cumulative average of $214 billion. Nonfatal injuries cost more than $456 billion every year. The costs come from medical treatments and lost work. Each year, more than 3 million people are hospitalized, and another 27 million treated and released in emergency rooms, the U.S. Centers for Disease Reports. Another 192,000 people die each year from unintentional injuries and violence. That adds up to about a tenth of the nation’s population every year suffering some form of personal injury that requires medical treatment or causes death. While 90 percent of the nation’s population gets through each year with no personal injuries, that does not mean a large percentage of the population is at risk of suffering personal injury. Often, those injuries occur due to someone else's negligence — and sometimes on purpose. When it comes to legal action, most people focus on personal injuries obtained through car accidents, negligence, medical malpractice and dog bites. Negligence accounts for virtually any situation in which someone in control of a property or while performing some act does so in a manner that no reasonable person would attempt. Negligence can include injuries sustained due to construction defects, improperly maintaining a property or vehicle, and derelict behavior. The experienced personal injury attorneys at Steinberg Law Firm have helped accident victims and their families to recover more than $500 million due to injuries. This category includes large truck accidents and motorcycle accidents, as well as pedestrian and bicycle accidents. Serious injury cases include head and spinal cord injuries, dog bites and other personal injuries that may require hospitalization or surgery, or that cause permanent disability. Workers’ compensation disputes, defective products and slip and fall accidents commonly cause injuries in this category. When you or a loved one are treated negligently by those responsible for your care, the effects can be devastating. Large truck accidents are particularly dangerous and can inflict costly casualties on victims. Large trucks weigh several times more than standard passenger cars, have higher ground clearance and require a great deal more stopping distance than a passenger car traveling at the same speed. That makes accidents with large trucks, such as tractor-trailers, particularly deadly and costly for accident victims. Yet, often, the person at fault is not readily apparent. Likewise, accidents involving motorcycles are particularly injurious and deadly for motorcycle riders and passengers. Other than helmets and other safety gear worn, motorcyclists and their passengers have very little protection in an accident. That means bikers suffer the worst of virtually any accident. Yet, the cause is not always apparent. Often, other drivers make errors that injure or kill motorcyclists, yet, many motorcycle riders also make errors that can cause bad accidents. Sorting out which party is at fault and dealing with insurance adjusters is a taxing experience when recuperating from a bad accident. An experienced car accident attorney is a great asset when dealing with the aftermath. That is particularly true when the cause is disputed and both parties claim financial losses. Personal injuries also occur due to negligence, and liable parties need to pay the costs of medical treatment and other financial losses. Whether the issue is premises liability, such as a wet floor in a grocery store, or a defective product that causes injury or death, the cost of treating personal injuries can be great. That is especially true in workers’ compensation disputes, when an employer or insurance provider denies a valid claim and attempts to blame an injured worker for injuries suffered while on the job. Even doctors, professional caretakers and entire facilities, such as a nursing homes, can be liable for injuries and death arising from negligent acts. When loved ones suffer due to the negligent or even criminal acts done by those who are tasked with caring for them, the suffering is compounded. An experienced personal injury attorney can help hold liable parties accountable and prevent further abuses. In South Carolina, the cost of treating injuries, lost wages and property damage caused by car accidents totaled more than $4.5 billion in 2016, the Department of Public Safety reports. That amount represents a 5 percent increase from the prior year and shows how rising costs of treating injuries in car accidents is rising rapidly. So are the costs of treating injuries arising from other common causes. DUI accounted for the most deadly collisions, with 206 in 2016. 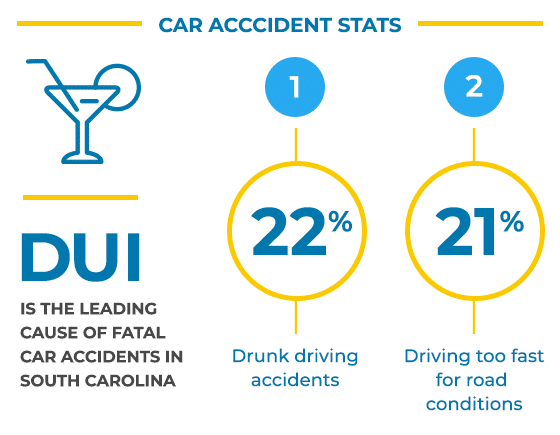 That equals about 22 percent of all deadly accidents in South Carolina and illustrates the extent to which one driver’s bad judgment can cause massive financial and emotional distress. South Carolina’s Department of Public Safety also shows driving too fast for road conditions accounted for 199 deadly collisions in the state, for about 21 percent of the total. Car accidents by far account for the most personal injury cases and settlement amounts paid by those held liable. The Centers for Disease Control (CDC) estimates car accident fatalities inflict more than $1.05 billion in annual costs across the nation. Those losses include more than $10 million in annual medical costs, plus more than $1 billion in lost work productivity. Car accidents in South Carolina and other states have many common causes, with driver error at the top. The South Carolina Department of Public Safety reports more than 133,600 traffic collisions occurred on state roadways in 2016. State police cited driver error as the cause in nearly 85 percent of those accidents, which includes 941 deadly collisions. An experienced personal injury attorney helps victims and their families hold liable parties accountable. The high cost of treating personal injuries makes it important for those responsible to pay the costs that otherwise might bankrupt accident victims and greatly disrupt their standard of living. A consultation with our attorneys can help clear up any issues and provide real hope for those dealing with the high costs of deadly and injurious accidents. Contact the Steinberg Law Firm today.